Deciding which tire pressure gauge to purchase can be a bit overwhelming considering the numerous options available . The good news is after you start defining your needs and preferences, the right choice quickly becomes clearer. This article will describe the differences in gauges and simplify the selection process for you. For the purpose of this article, we spoke with an industry expert and one of our sponsors who make this resource possible – OG Racing. Please show them your support with your racing gear needs. Have you ever found yourself taking with friends or even industry experts at an event about optimum tire pressures then simply setting your pressures based on that? 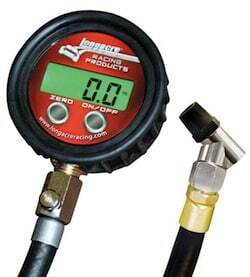 A few years ago I was at a track and set the tire pressures on my racecar. A friend of mine was trying to be helpful not realizing that I had already set them, and measured the pressures with his gauge. He mentioned that in order to reach the initial pressures I wanted, it would be necessary to add more air into the tires. I was puzzled as our pressure readings were about 5 psi off from each other using the two different gauges. This made me curious and I had a few other people compare what their tire pressure gauge readings were. The results were interesting as the tire pressure readings varied among several of the gauges. It was at this point when I learned to only use my tire pressure gauge on my car going forward. I also became even more aware of the downsides of taking other peoples’ pressure suggestions beyond serving as a starting point. 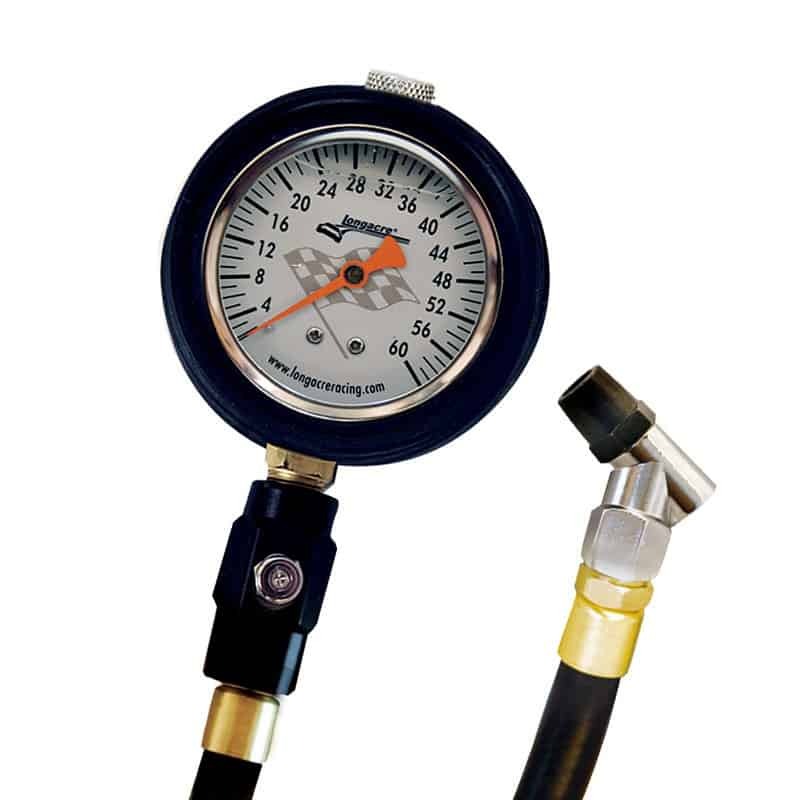 The most important aspect of a tire pressure gauge is for the tool to be consistent and repeatable. 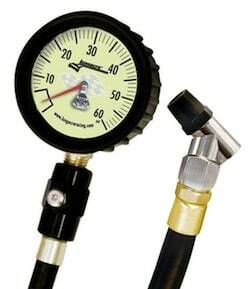 Does it really matter if the gauge reading states 35 psi or 40 psi if you’re always using the same gauge? No it doesn’t. While the gauges are tested for accuracy when built, stuff happens. Don’t you just love how some boxes you receive marked Fragile have holes in them or have obviously been beaten up a bit? In theory if you really want to ensure that your gauge is consistent, you could buy a second, inexpensive gauge to occasionally compare the two readings. Store the second gauge in a safe place where the temperatures do not quickly fluctuate. The more inexpensive gauges that OG Racing sells are not less accurate than the more expensive units and would fit this purpose. When looking at the various gauge options, there are a few considerations which will help determine which gauge is right for you. Digital gauges are easier to read but come with a slightly higher price tag. I like the idea of a digital gauge, but also appreciate the simplicity of an analog gauge. I just picture myself being in a rush to set the pressures only to learn that the battery has worn out. Fortunately most digital gauges automatically turn off in approximately five minutes of non-use, and some, like Longacre gauges, use AAA batteries. When speaking with a representative at OG Racing, I found it interesting that the majority of racers buying gauges for themselves buy analog. Yet people who are buying them as gifts typically choose digital. Liquid filled gauges are purposely filled to just 80%. The remaining 20% air pocket helps allow for thermal expansion and contraction as ambient temperature change, thereby maintaining accuracy. If the gauge were filled to 100% even the slightest temperature change would significantly affect gauge readings (3 – 5 psi) as the expanding fluid would have no place to go. To ensure pressure accuracy over a wide operating range, Longacre gauges have a Special Vent Valve. Most other brand gauges have a similar type of vent. Turning the knob allows you to equalize internal and external pressures so it’s accurate. These types of gauges were much more popular in the past, but have essentially been replaced by the newer analog and digital styles. I consider Longacre to be the Gold Standard. They have a proven history of building quality gauges. Not only do they test them when built, they also test them before being shipped. I personally have been using their gauges for many years. They work extremely well and as a result, OG Racing carries their gauges almost exclusively. An interesting fact is that all of Longacre’s pressure gauges have the same accuracy and mechanics regardless whether one is looking at an inexpensive Standard gauge or the more expensive models. Below are some notes that will be helpful when comparing the various Longacre gauges. Note: All of Longacre’s gauges come with an air pressure release valve. The air chuck is not attached to a swivel head. 2 ½” gauge face display. The air chuck sites on a swivel head which is a nice feature. Holds the reading until released. Another handy feature. Of the gauges, the Deluxe is my personal favorite and what I use. This gauge is essentially the Deluxe model, just with a huge face. The air chuck sites on a swivel head. This gauge also comes with a carrying case. Pressure holds until you reset it. Auto off feature to save battery which can be adjusted by user. Treat your gauge much like you would a torque wrench or other sensitive tool and it will provide you several years of service. While vibrations from being stored inside of a car won’t hurt it, being thrown around most certainly will. It is okay to store it in cold locations such as your garage during winter (if you’re in a northern location), but try to avoid it experiencing major quick temperature changes. A special thank you to OG Racing for contributing to this article.